This is our doll Allie and her house. My three daughters and I were given Allie and her house from a dear neighbor we lived next to in Norfolk, Virginia. Our neighbor, Allie, had no one to leave her dollhouse to, and when we moved home to San Diego she gave it to us so that she knew it would be passed into a loving family! How blessed are we?!? Allie's house needs a little redecorating, so I thought Club Little House would be a wonderful adventure. 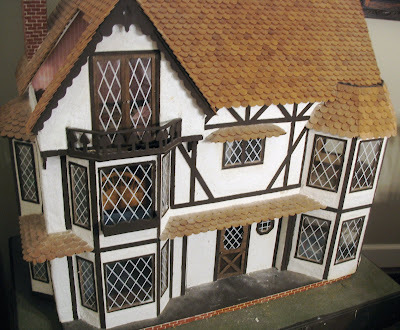 That is a wonderful dollhouse Allie has! French Tudor, ooh la la! You've come to the right place! Allie is beautiful and you and your girls are lucky to have her and her wonderful house. What a wonderful gift! 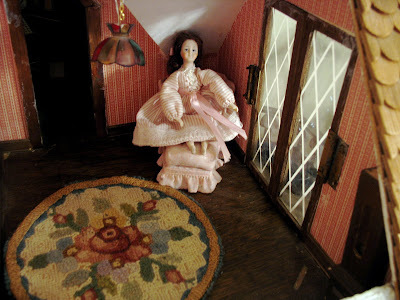 Allie and the dollhouse are wonderful and you're going to have so much fun with the Club Little House creations.